What do lemurs, Jimi Hendrix, and a national park have in common? That would be Patricia Chapple Wright. Now a renowned primatologist and conservationist, Wright discovered her love for monkeys at a Jimi Hendrix concert more than three decades ago. Having arrived early, she popped into a pet store across the street and immediately felt a spark of connection with a little owl monkey with big brown eyes. That connection led to a burning curiosity about monkeys and their social interactions. It took Wright from the forests of Colombia to the island of Madagascar, where she studied the elaborate behaviors of the tropical nation’s lemurs and eventually established both a national park and charity research organization for the conservation of these small primates. We have a lot to learn from lemurs, according to Wright, who teaches at Stony Brook University in Stony Brook, N.Y. For example, captive lemurs can develop diabetes and Alzheimer’s — diseases that seem to be entirely absent in their wild populations. This is still a puzzle to scientists, and figuring it out could have implications for the way we treat humans. Lemurs also evolved into 103 different species over the last 60 million years, finding ways to cooperate and interact as they shared the same forest. They were the first mammals to arrive on Madagascar from Africa, leaving them without predators until humans came and hunted them. This unique evolutionary history makes them an interesting set of animals to study because not only are their behaviors and adaptations unique, but they also play an essential role for the rest of Madagascar’s ecosystem: pollination. “They are the coolest mammals!” Wright exclaimed, showing photographs of the different species of lemurs she has encountered to a crowd of science enthusiasts gathered at the Bell House in Brooklyn on Sept. 22. Wright splits her time between Madagascar and Stony Brook, N.Y., so she can study these animals in the wild. They are only found in Madagascar, which separated from Africa 165 million years ago and has been fairly isolated ever since, allowing animals and plants on the island to evolve independently. “Madagascar is so different from anyplace else on this planet,” said a fellow primatologist, Susan Perry of the University of California in Los Angeles. There is a huge range of animal and plant species there. The trees are bizarre shapes. “It looks like something Dr. Seuss would make up,” she said. 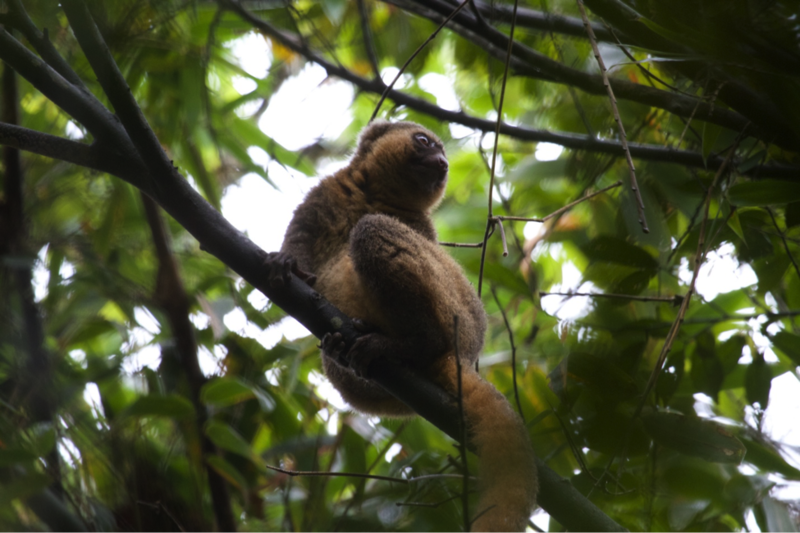 The physical adaptations and behaviors of lemurs match the unusual landscape. For example, the aye aye, which was one of the first lemurs Wright studied when she arrived in Madagascar, is also the world’s largest nocturnal primate. And while most other lemurs eat only fruit, aye ayes had developed rodent-like, continuously growing front teeth to help them find and eat insect larvae hiding inside tree trunks. Another kind of lemur, known as the golden bamboo lemur had adapted to eat cyanide-laced bamboo shoots — a deadly snack to any other primate. She spent three decades trying to understand this family interaction in lemurs. And when she realized that slash-and-burn agriculture, illegal mining, and logging were destroying the lemurs’ natural habitat, Wright decided to dedicate her time to conserving their habitat too. In 1991, she raised enough money to establish the Ranomafana National Park — the same place where she spent so many years observing lemurs. The eco-tourism that followed has helped her cause by creating economic growth and alleviating poverty amongst local Malagasy people to some extent. So Wright remains enthusiastic about the future. “I want you to know that there is hope,” Wright said.